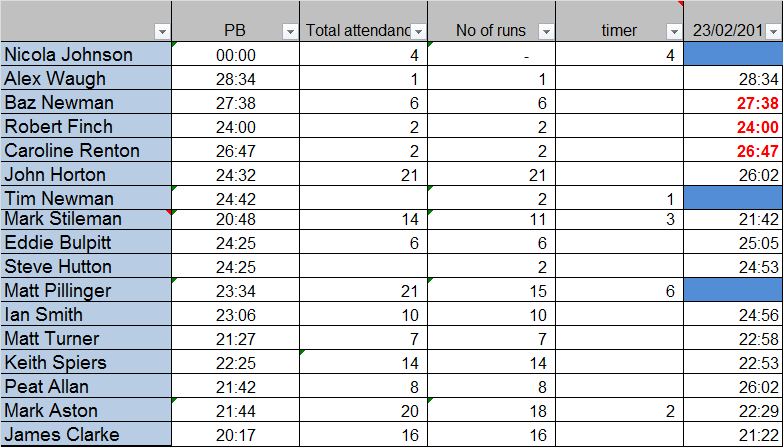 The February 2015 handicap was well attended – perhaps buoyed by both the mens and ladies records being set in February (2013 & 2014 respectively) you were hoping for a little bit of that magic to rub off, there were 14 runners out. Sadly there was no new course record, but Caroline Renton ran 26:47, recording a new personal best and in the process the 3rd fastest ladies time ever. Positions 1 & 2 are held by Naomi Stanley, with the best being 26:16. Also recording new PB’s were Baz Newman, for the 2nd consecutive month and Robert Finch, who knocked a mighty 3:40 off his previous best to record 24:00. We were also delighted to welcome first timer, Alex Waugh, who ran a very creditable 28:34. As you know I do love current consecutive attendances, being the person who has attended (running or timing) the most consecutive handicaps stretching back from today. Both Jules and Ian R missed todays event, so Mark Aston now leads this competition on his own, having run or timed every event since August 2014. Ian Smith is in second place, with a run (boom boom!) stretching back to September. As mentioned above, the ladies record of 26:16 is held by Naomi Stanley (Feb 14), while the mens record, is held by the only person to run sub 20:00, Paul Ashley, with 19:20 from February 2013. The next event will be on Tuesday 24th March and I will send out a calendar invite closer to the time.